I am so pleased to have received another award, this time from my good and brave friend, Dorky Deb. She is actually anything but dorky. Instead, she is a mother and wife, full of good cheer, dealing with life despite the odds stacked against her. She is also a wonderful photographer. 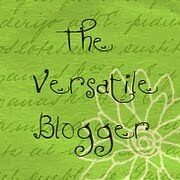 This version of the award The Versatile Blogger is one I have eyed for some time. I’d also like to congratulate my fellow award winners. If you’re interested, you can visit Deb’s blog and find her list of current winners there. Congratulations to you all. You have entertained me, informed me, and/or made me laugh. You all excel at your writing and your blogging. Thank you. 1. When I was in my 20s, I won $100 on a Montreal TV game show called “Little White Lie” where I told my life story to the panel, and they had to guess which part was NOT true. They could only ask me questions answerable by yes or no. They didn’t guess correctly and I won the money. I was so excited. 2. 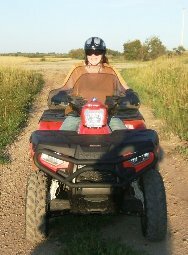 I was the first live female all-night radio broadcaster (DJ) for CHQR in Calgary when it was a middle of the road music station (MOR). My show was from midnight to 6am; since CRTC rulings regarding music mix didn’t apply at that time, I got to pick my own music. I loved it, although I never did get used, after three years, to sleeping during the day and working all night. 3. My great-great-great-great-grandfather (perhaps even more greats, not sure) was an Irish king, who was hung by a rival tribe for horse thieving. 4. I wrote my first “book” at the age of 7. It was entitled “Angus the Ant,” was five pages long and self-illustrated. My one big regret is that somewhere in all the moves of my life, it got lost and never found. 5. In the ’70s, ’80s, and part of the ’90s, I toured parts of Canada and the United States as an international lecturer, speaking on inner peace and self discovery. It was a wonderful time of learning and sharing for me. I met hundreds of great people and probably learned as much from them as they learned from me. This entry was posted in General, Non-writing posts, Profile and tagged Award, Calgary, CHQR, Little White Lie, postaweek2011, Versatile Blogger. Bookmark the permalink. It’s been awhile since I’ve stopped by. The new look is awesome! Congrats on the versatile award. You totally deserve it, Sandra!!! I’m glad you like the new look. I did it a while back but haven’t posted much since. Thanks for the congrats. I do love getting awards. I guess everyone does lol I have two stories to post as soon as I finish them (just last quarter to go in each). One is flash and the other…isn’t. I will try and get at them today. Love the new look. Congrats, Sandra. Your #3 intrigued me . . . my great-great-great-great-great-great-grandmother was accused of witchcraft in Salem, Massachusetts, and hung during the Witchcraft hysteria of 1692. I also have a Scottish witch way, way back on my mother’s side. Oooh, lotsa witches. I’m thinking that’s a good thing! Thanks for sharing all these interesting things about you! And yes, share the recipe! Fry hamburger, red pepper, onions and mushrooms together. I usually do it in one big skillet and don’t mix the veggies with the hamburger until they are cooked. When they are cooked, mix them all together with the hamburger. While hamburger mixture is cooking, prepare fusili according to direction. When hamburger mixture is cooked, add peas and let them cook for a couple of minutes, then add cheez whiz, let it melt and mix it with mixture thoroughly. Add tomato soup (but no water) and mix in thoroughly. Finally add the honey and mix in thoroughly. Drain the fusili and add it to the mixture, mixing it in thoroughly. Serve with fresh tossed salad and crusty buns. Congratulations Sandra 🙂 And thanks for liking my blog. I assume the rules that you were referring to include picking 5 recipients and publishing 7 facts about myself. Let me know if that is correct? Congrats on the award Sandra! You certainly deserve it, you are a great writer! I’m thrilled that you thought me worthy to be one of the recipients, thank you so much, and I will do my best in passing it on to another 5 bloggers. You’re very welcome. I certainly do think you’re worthy. I think everyone in the world should read your current post about not giving pets at Christmastime. And I love the pics and jolly stories you tell about animals, your walks along the beach, your wonderful hubby, and did I mention the pics? You definitely earned the award. I’m looking forward to seeing your 7 things people don’t know about you. It’s done, I posted it about 5 minutes ago! You’re very welcome. I certainly do think you’re worthy. I think everyone in the world should read your current post about not giving pets at Christmastime. And I love the pics and jolly stories you tell about animals, your walks along the beach, your wonderful hubby, and did I mention the pics. You definitely earned the award. I’m looking forward to seeing your 7 things people don’t know about you. I love the new look too. Oddly enough, I’ve also always wanted to whistle with my fingers, but I don’t have anyone to teach me. Maybe you can do a tutorial on it on your blog! Isn’t that a coincidence, HG? Or…I wonder if many women wish they could do it but didn’t have the time or a teacher to follow through. I don’t know if I could explain it well enough, but over the holidays I’ll give it a go. I can’t bear the though of someone who wants to whistle like that not being able to. I’m glad you like the new look, and thanks for dropping by.